As a therapist and life coach, I’m always fascinated when my colleagues use our profession as a creative springboard. Marilee Goldberg Adams has drawn on her myriad experiences as a therapist, workshop leader and life coach to write two books: the first, The Art of the Question, a textbook about cognitive behavioral psychology, is a guide to short-term, question-centered therapy. Its theories and principles became the inspiration for her second book, Change Your Questions, Change Your Life. 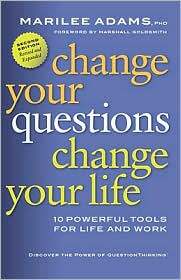 Written as an engaging fable, Change Your Questions, Change Your Life inspires readers to take charge of their thinking in order to accomplish goals, improve relationships, advance careers, investigate new territories and, in general, gain greater life satisfaction. I began my chat with Marilee by asking about her professional background. MARILEE ADAMS: I have a Masters Degree in Social Work from Virginia Commonwealth University in Richmond, Virginia. and a Doctorate in Clinical Psychology from The Fielding Graduate Institute in California. I was a therapist for many, many years, about 35. I mostly worked with adults, groups, families and couples. I did that until about 1998 when I wrote my first book The Art of the Question. JOAN BARTH: Did you always know you would eventually become a writer? ADAMS: I’ve always been a voracious reader and still am. I have memories of hiding in a closet reading under a light bulb as a kid. But, even so, I didn’t expect to become a writer. BARTH: What are you reading now? ADAMS: I recently read Katharine Graham’s autobiography. Someone just sent me the Guernsey Literary and Potato Peel Society. I liked that a lot. I’ve read Three Cups of Tea. I’m reading the book Which by the Seek brothers on difficult change. I’m reading David Allen’s book Getting Things Done. I really hope this will tell me how to get things done because I could really use it. I’m also reading a book called The Geography of Thought which is fascinating. It’s about how differently Westerners and Asians think and how that affects everything else. I could keep going since I have a lot of books going. BARTH: What made you decide to put your theory that changing your questions could change your life into book form? ADAMS: The workshops I was giving produced some very positive results and people started urging me to write a book based on them. I decided to take it on so I hired a writing coach, because I had no clue how to write. That was a really smart move. BARTH: Do you make an outline first? ADAMS: No. There’s a difference between the seedling of an idea and the expression of it. I’m talking in the nonfiction genre. Even though my second book is a story, it has a lot of nonfiction in it. In the nonfiction world, you don’t have to write the whole manuscript as you need to with fiction. You basically have to do a proposal in order to sell your book. It’s an arduous, essential, pain in the neck, but it’s worse if you don’t. Writing a proposal forces you to conceptualize the book and organize it and pick apart a whole lot of different material. These days, you also have to think about the marketing of the book. There are very few publishers who would buy a book or bet on a book if they didn’t think the author would voraciously market themselves. Whether you think that’s a good thing or not, it’s the reality of the day. BARTH: Do you think e-books have made a big change? Have they gotten in your way? ADAMS: Well, that’s a very different question. To write a good book, whatever the format is, the book has to be organized well. So, otherwise, the book isn’t going to work. It doesn’t matter what the venue is, it still has to be good. Has the electronic digital age affected the publishing industry? Hugely! BARTH: What do you enjoy about the writing experience? ADAMS: I immerse myself in the writing and I remember thinking, to my surprise, that it was one of the most intimate experiences I ever had and the intimacy was with myself. To have the time and the permission to explore and unfold and to go down a highway that turned out to have a dead end was…it was a wonderful experience with myself. BARTH: When are you most creative? ADAMS: I think I am more creative in the morning. When I am immersed in a writing project, I love to be in front of my computer, even if I’m wearing my pajamas. I pour the night’s work into what I’ve developed. BARTH: So, do you have a special place where you write? Do you have a certain chair, a certain desk, a table? ADAMS: The more I work on my computer, the more I think with my fingers. But I also have a need to print things out and write on hard copy. I’ll make notes all over the page then I’ll go back and input new ideas. I’ll print that layer out again. There are a lot of places in my house where I enjoy doing writing. I find that there are some postures where I sit with my legs up, and my spine back. I think more creatively there. BARTH: How did you decide to switch from nonfiction to fiction? ADAMS: Well, I didn’t exactly switch. Change Your Questions, Change Your Life is written as a fable, but it contains the same theories as my textbook. I wanted to make the material as easily digestible as possible. Human beings love stories. They love page-turners. I wanted to create a page-turner inside which readers would learn the material without noticing they were doing so. Although, hopefully, they would be able to see the results. The first book was very arduous and I wrestled quite a lot with it. At the same time, the writing was relatively straightforward. That doesn’t mean simple. It was made up of pieces of clinical sessions, but I still had to rewrite them in a way that was readable. The second time, I didn’t want to do that kind of book again. As you know, there is a really strong mission to my work. I have a big commitment to my audience and I was lucky enough to find a publisher, Berrett-Koehler, that is very aligned with my vision. I was really thrilled when they accepted my book because they choose only 35 a year out of thousands of manuscripts. BARTH: What compels you to write? ADAMS: I have a theory that people have one of two reasons to write. One is that they can’t not write. They just have to. The other is that they have something to say and that writing is an important vehicle for that. I think I fit in the second category much more than the first. So my obligation to myself is to write well, but that wasn’t the main reason that I began to write. I enjoy it very, very much. The biggest challenge is clearing the deck because of my schedule. When I’m really into it, it’s very hard to stop. In fact, I don’t even answer the phone. BARTH: Do you have certain days when you do answer the phone? ADAMS: Oh, I always answer the phone eventually. But I’m not one of the people who is like a puppet on the end of a string, so that when the phone rings, they jump. BARTH: Do you recommend reading books on writing? ADAMS: I think it’s really helpful to read books about writing. I like Natalie Goldberg’s Writing Down the Bones. The writing coach that I’ve worked with, Hal Zina Bennett, has written a lot of books on writing, most recently Write Start. He’s been a wonderful coach for me.